Regular outdoor workout training is held at the KENGURU PRO workout grounds in Neskuchny Garden. As a rule, doing sports in a large group of people is highly effective: joint training brings people together, increasing the results of each athlete. Beginners can quickly learn exercises by communicating and watching more advanced athletes perform on the workout grounds. Great motivation to start on your own path in the world of workout. 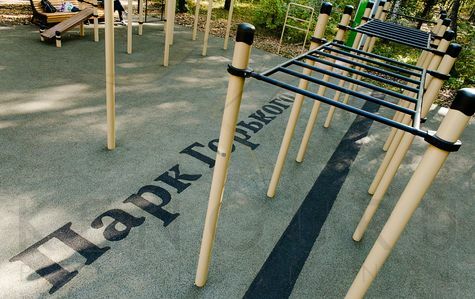 The workout area in the Neskuchny Garden provides a venue for large-scale training and events. The workout area has two lanes of equipment for speed and endurance competitions: the classical three-level horizontal Monkey bar set-up with 5 horizontal bars – in both lanes; Swedish wall – in both lanes; low double parallel bars – in both lanes; double, multilevel parallel bars for push ups – in both lanes; support with rope (with a 2.4 m horizontal bar on poles at the height of 4.5 m) – in both lanes. Up to 60 people can simultaneously train on this workout area. We wish to encourage you to visit the KENGURU PRO workout grounds as often as possible and bring all your friends to do joint training. Passing adults and children are greatly motivated by athletes, and may even join the training in the future. The more people do sports on the KENGURU PRO workout grounds, the healthier and stronger society becomes.